Move beyond your thoughts and daily concerns as you listen to the deeply relaxing Hemi-Sync® sound patterns of Transcendence. 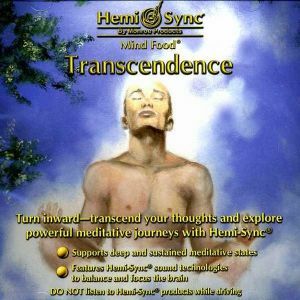 The verbal guidance and Hemi-Sync® signals incorporated on Track 1 will lead you in the exploration of expanded states of consciousness. Create your own experiences with Track 2, an extended free flow exploration without verbal guidance. Transcendence will leave you centered, focused, and totally refreshed. Altered state of consciousness, meditation, spiritual growth.